If you're looking for design ideas and inspiration, as well as great finds to help you, then SM Home is the right place to go. It is the best source for furniture, tableware, kitchenware, storage solutions, linens and home décor in the country. Moreso, SM understands your need for inspiration, design ideas, and sumptuous imagery that it has commissioned five (5) of the most creative talents in the country to design a beautiful series of interior design vignettes to be showcased in SM Makati for the entire month of July. The designs feature items that can be found in SM Home, and a number of selected items from the designs will be on sale while the exhibit is up as an added bonus. “There is so much more to making a space functional and beautiful than just choosing and buying great individual items. How items blend together and contribute to the aesthetics or the function of a space are just as important, if not more,” continues Tom “That is why this year, we’d like to help our customers get their creative juices flowing by exposing them to a lot of great design, and sharing practical design tips with them.” Done in the fashionable Scandi-chic style, and almost exclusively with items available at SM Home, the vignettes are an eye-opening showcase of what is possible to do with even the simplest and most inexpensive items in the store, when one adds the elements of cohesion, balance, function, and a bit of creative flare. For the vignettes, the designers were asked to design for a power couple between the ages of 28-34, who love travel, and photography, and who lead very active lives. The dining room is done in the crisp, clean, deceptively spartan lines typical of Scandi-chic, a well thought out use of color and contrast creates a warm and cozy feel. Designed by Nina Santamaria of Grupo Santamaria, the dining room is a perfect example of seemingly plain looking items coming together to create a beautiful, functional and inviting space. Leaning towards the edgy side of modern, the living room vignette of Misty Floro and Pai Edles of Morfosis plays with unconventional furniture layouts, and uses accents such as an area rug to define space. “The objective is to highlight the versatility of the living room and the countless possibilities a living room presents for a designer,” shares Misty Floro. An interesting highlight of the space is the accent wall, which serves as an optical illusion that presents a different view from every angle. Iriss Mangio of ILM Interiors designed the home office space in a style that was quite eclectic, combining bohemian elements, with retro-objects, while managing to make the space look both cohesive and new. Iriss’ vision of a couple’s home office is a functional room that doubles as a relaxing space to just hang out in. These seemingly contrasting ideas are achieved with the well thought out positioning of large functional pieces, and strategic arrangement of plants and accessories. Angelo Siochi’s vignette of the couples’ bedroom is intimate, relaxing and a great canvas for adding personal touches. Colors and accents, and décor combine for a room that is conducive to relaxation, but Angelo has provided ample space on shelves, walls and tables for the couple to add their personal touches. “A designer’s job in designing a bedroom in not just to make a beautiful space, but to allow clients to personalize,” explains Angelo. In a departure from typical showhouses, the kitchen space was styled by renowned pastry chef Miko Aspiras, in partnership with a local designer who helped bring his vision to life. “It may not be so with other rooms, but in a kitchen form needs to follow function all the time, a beautiful space is worthless unless it performs its function well. This is more true of a kitchen than any other space in a home,” explains Tom, “To create a great working kitchen requires extensive knowledge of how food is prepared, as well as experience in working in kitchens. Pastries are particularly process intensive and precise, so Chef Miko really stood out as a logical choice,” he adds. 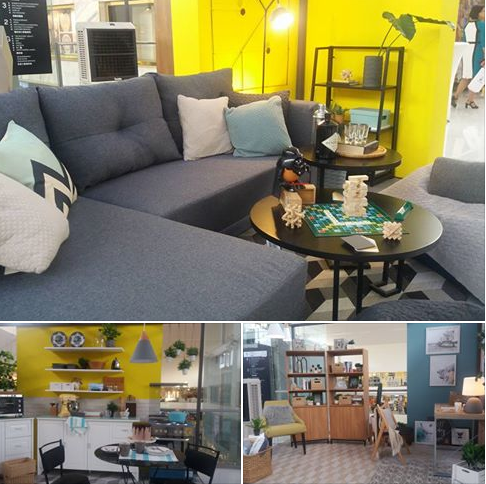 The designers were on hand for the grand launch of the vignettes, discussing their vision for the spaces, sharing their favorite items from SM Home, and sharing some very useful tips with the exhibit’s first guests. The vignettes are open for viewing at the SM Home Makati branch until July 31.